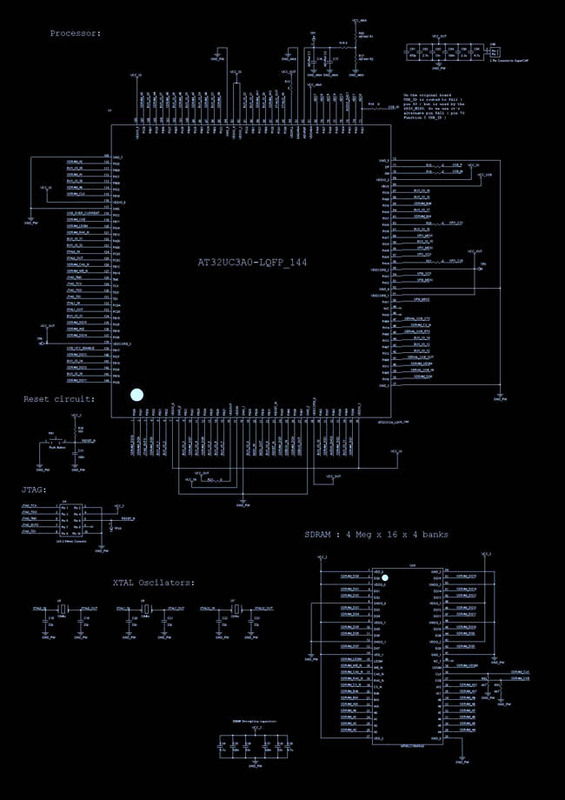 These are the schematics of the board. You can download them in ORCAD format in the "License and downloads" section where you will also find the source of Synth Core Libs . 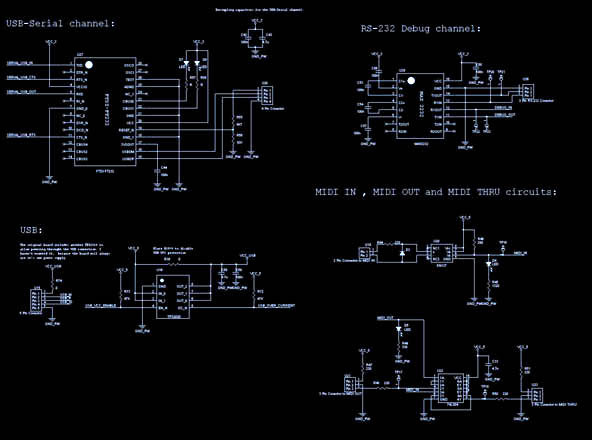 ATENTION: DAC needs important modifications to improve S/N ratio, it must be implemented in differential mode, and this implies changing the preamplifier. 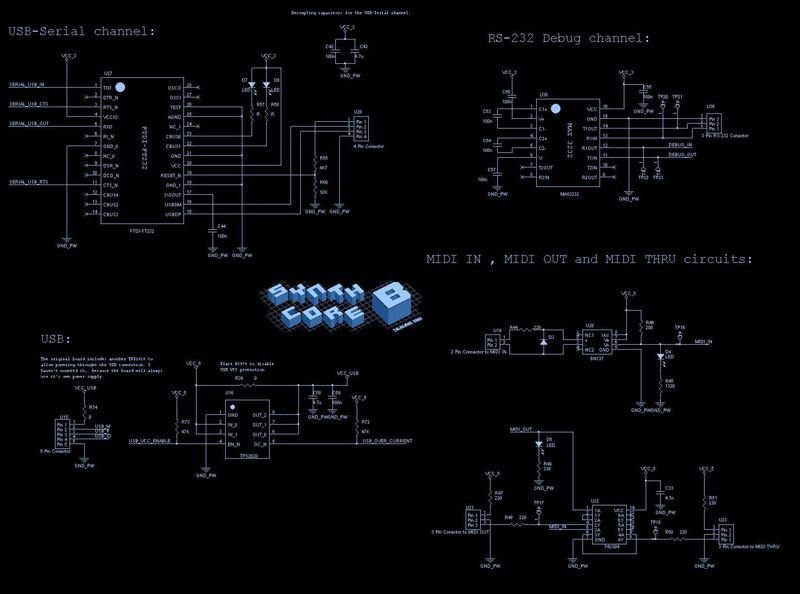 - place the provided Synth Core Libs logo in a visible place of the front panel of your device. - if the device has a website, it must explain that it is based on Synth Core B and Synth Core Libs. 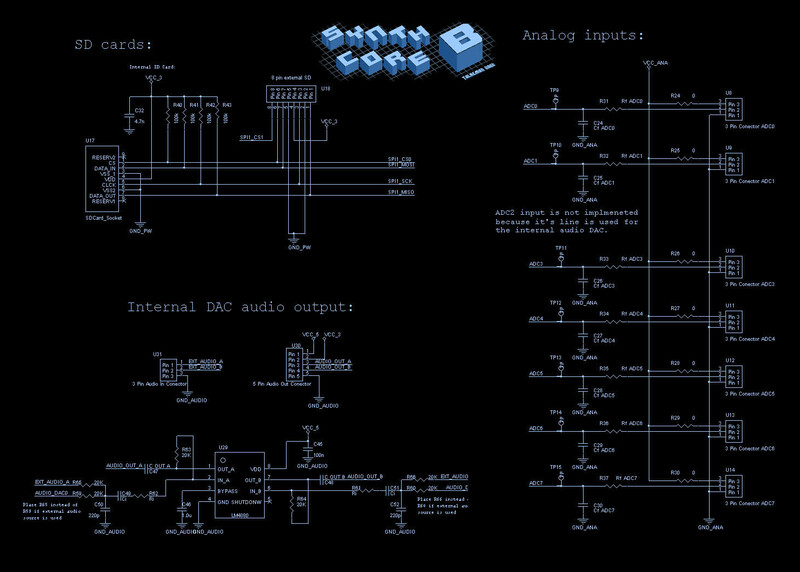 It must also show the provided Synth Core Libs project logo in a visible place. The logo must link to Synth Core B and Synth Core Libs project site. 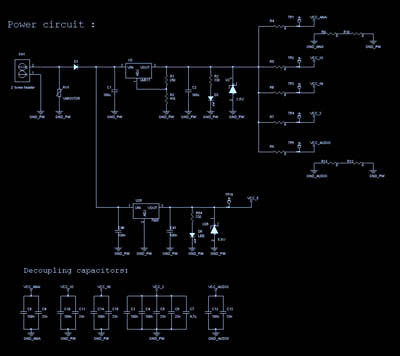 - if the device has a screen ( LCD or any other display ) it must show a message informing that the device is based on Synth Core B and Synth Core Libs project. This message must appear for at least 2 seconds when booting. - if the device has a handbook or an information sheet, it must explain that it is based on Synth Core B and Synth Core Libs. 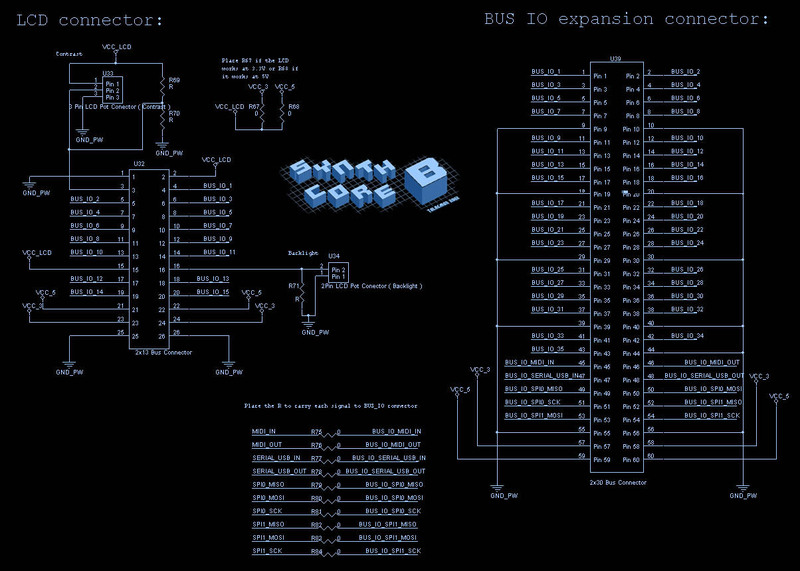 It must also show the provided Synth Core Libs project logo in a visible place. -if the device is distributed only as spare PCB, or as an electronic board, it must appear a reference to the Synth Core Libs project on it's silk screen. - Disclaimer of Warranty: Unless required by applicable law or agreed to in writing, author provides this software and hardware on an "AS IS" basis, without warranties or conditions of any kind, either express or implied, including, without limitation, any warranties or conditions of title, non-infringement, merchantability, or fitness for a particular purpose. You are solely responsible for determining the appropriateness of using or redistributing the Work and assume any risks associated with Your exercise of permissions under this License. - Limitation of Liability: In no event and under no legal theory, whether in tort (including negligence), contract, or otherwise, unless required by applicable law (such as deliberate and grossly negligent acts) or agreed to in writing, shall the author be liable for any damages, including any direct, indirect, special, incidental, or consequential damages of any character arising as a result of this License or out of the use or inability to use the software (including but not limited to damages for loss of goodwill, work stoppage, computer failure or malfunction, or any and all other commercial damages or losses), even if the author has been advised of the possibility of such damages. 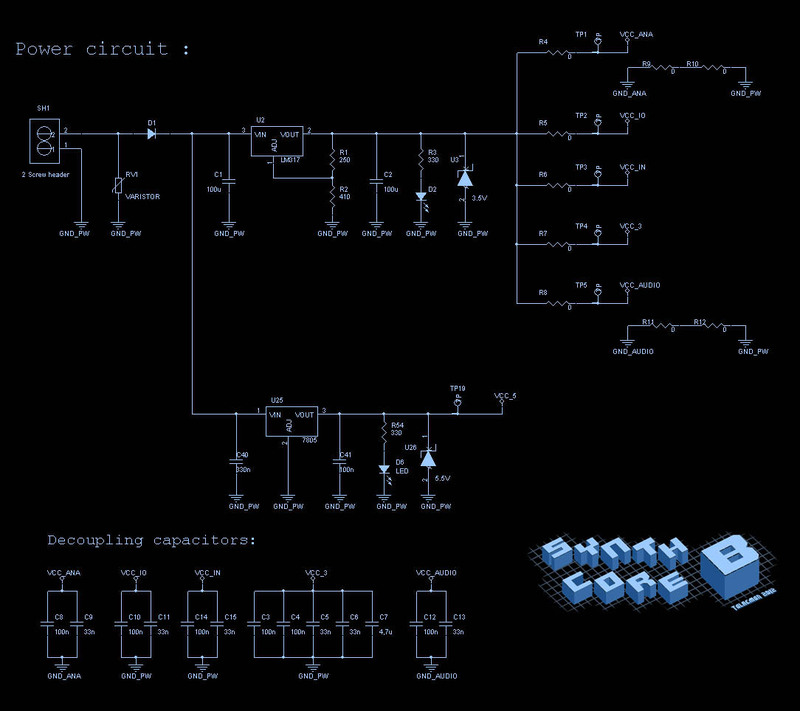 All this means that you can design and build your own synth or controller using the hardware of Synth Core B ( or parts of it ) and the code of Synth Core Libs ( or parts of it ) and redistribute it or sell it without having to pay anything to me, and without having to ask for any authorisation to me. Also you don't have to share the code or schematics of it if you don't want to ( anyway it would be nice you share the whole project with the community, but that is your decisision ) . The only thing you MUST DO is what is specified in the project license: place a visible reference to the project in the specified elements ( front panel, website, handbook, display ... ). 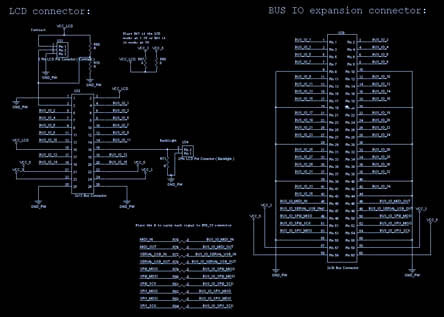 The idea is that the user must know that the device he is using is based on Synth Core B and Synth Core Libs project. 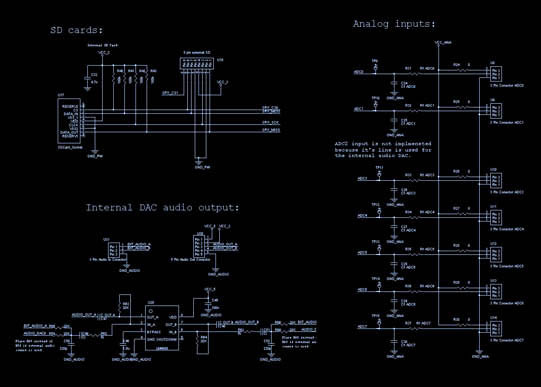 You must also accept the "Disclaimer of Warranty" and the "Limitation of Liability"
-Schematics and layout of Synth Core B in ORCAD format. 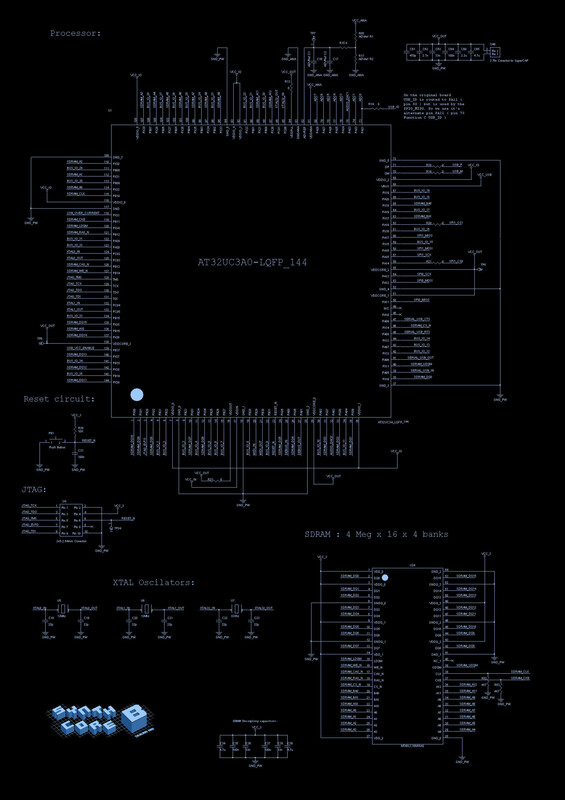 -Source code of Synth Core Libs (Atmel AVR32 FreeRTOs project with Synth Core Libs). The code of the main routine of the must be arranged but all the libs are functional, I'll try to provide sample projects soon .
. . . Label, Program & Audiovisuals Tolaemon 2012 . . .